The parish of Gortletteragh had much reason to celebrate on the August Bank holiday weekend when the Drumgownagh school reunion and heritage project went live. It got off to the best possible start on the Friday night with a large gathering in the Welcome Inn, Cornageeha. Michael Moran and Tommy Hand rang in the celebrations with the singing of ‘The School Down In Drumgownagh’; a song written by Micheál McGarry specially for the Reunion festivities. Master Micheál then presented a hilarious ‘School around the Corner’ sketch with many past pupils taking part. It was a remarkable first night that set the trend for the rest of the celebration. You would need to be there to witness the depth of feeling that was present as old school friends came face to face, some of whom had not seen each other for over sixty years. 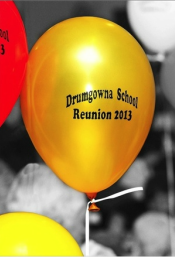 Drumgownagh school took centre stage from early Saturday morning as she began to welcome home her many school children. The past pupils were thrilled to find that the school hadn’t really changed at all from their schooldays, only now it was adorned with rare photographs and memorabilia. Even the master’s Austin A 30 car was still outside the school. The huge crowd that showed up took it in turns to sign the visitor’s book and the Reunion Wall that was erected specially for this important occasion. For many it was an emotional returning, seeing the Milk of Magnesia and Sauce bottles of tea still lined up at the fire and oaten bonnach still on the lunch menu and to receive a homecoming certificate was the icing on the cake. On Saturday evening there was a great sense of occasion as past pupils and friends began arriving at St. Joseph’s Church, Cornageeha for the Reunion Mass. The setting sun over Annaghmore cast its brilliant golden rays directly through the open doors of the church, travelling straight up the main aisle, illuminating the altar and the already beautiful colours of the floral arrangements, giving the feel of Newgrange on the Winter Solstice. It was an evening when past pupils, teachers and everyone associated with the school were remembered in prayer. The many past pupils who weren’t able to be with us except in spirit and those who had passed to their eternal reward were also remembered. For many the Reunion Mass was the highlight of the weekend. Fr. John Quinn P.P. warmly welcomed all those attending the Mass, which was celebrated by past pupil Fr. Tom Colreavy assisted by Fr. John, Fr. Michael McGowan (past pupil) and Canon Bill Atkins from Farnaught Church of Ireland, who read the Gospel. John Flynn read the First Reading and Ursula Gray-Creegan read the Second Reading. Prayers of the Faithful were read by Anne McCabe-Kane, Peter Quinn, Mary Heslin-Keating, Charlie McKenna, Annie Keighran-O’Keefe and Denny Mahon. Fr. Tom gave a moving and of’times funny homily that brought us back in time and touched a chord with the congregation. Jim and Gail Griffin, two great grandchildren of Patrick Griffin, the first Drumgownagh school Principal brought the gifts of the Bread and Wine to the altar. Sr. Rosaleen Heslin read a nice Reflection of thanks. The choir and their musical accompanists, Mel Crowe and Patricia Guckian, who were joined by the congregation in full voice, added greatly to the service. The singing of Lovely Leitrim at the end of Mass triggered some very happy emotions. For the many emigrants among the congregation it wasn’t a ‘dream’ as in the song; they were all back home in Cornageeha and thrilled to bits to be here. It was now time to move on to Gortletteragh Community Centre for a social evening and the unveiling of the commemorative Reunion Book, Drumgownagh School Reunion and Heritage Book 2013, which was launched by the young acclaimed writer, Belinda McKeon, whose grandmother, Eileen Heslin of Keeldra attended the school. It was a touching moment when the editor, Jacinta Heslin was given a standing ovation by the packed hall for her great work in compiling this fine publication. MC for the night Pat Bohan then called on Pat Byrne to make a presentation of Leitrim Crystal to Belinda to mark the occasion of her visit while Cissie Bohan presented her with a bouquet of flowers. Noreen Heslin presented a bouquet of flowers to Jacinta as a gesture of appreciation on this well collated book which runs to 416 pages. It is a real treasure trove of memories with nuggets of folklore and historical information and has a photo gallery of 1,500 photos representing almost 200 families from the area. Many of the photos are priceless images. Its contents generated much chat until the early hours of the morning as the whole gathering gained momentum. Eilish Reilly-Hourican , an ex teacher of Drumgownagh said a few inspiring words as she clutched a Child of Prague that she received as a present when she left the school all of fifty three years ago . Her presence and that of Master Michael Kelly, who was principal in 1951/52, brought back memories of the many teachers who taught in Drumgownagh from 1886 to 1971. We must take our hats off to J’s Catering team who rose to the occasion, performing a modern day miracle of the loaves and fishes in the Community Centre, serving food to the multitudes that turned up. On Sunday, as the three hundred and fifty guests arrived for dinner at Lough Rynn Castle Hotel, they were greeted by the beautiful sound of the harp and how appropriate it was to hear Mairéad Whelan perform compositions like Sí Beag, Sí Mór and Madam Crofton as we were now within earshot of the blind harper’s 18th century home at Lakefield. It really was the perfect setting for a hugely enjoyable day. People were highly impressed with this state of the art hotel. As the Reunion cake was being cut, Fr. Tom Colreavy, on behalf of the past pupils, spoke of what the weekend meant to them and how they were all so overwhelmed and blown away by this Reunion experience. He thanked the committee for organising this wonderful ‘coming together’ and spoke of the joy and happiness that the weekend had brought to so many people. Indeed it was very uplifting to hear people, some of whom had travelled the world, speak of this as being the best weekend of their lives. In the evening the by now joyful crowd were entertained by Michael Moran, John Joe Higgins and family and a host of other artists. After our hectic day in Lough Rynn Castle Hotel the crowd retired to Foxs’ of Tooman for another fantastic night of song and dance and even more reminiscing and story swapping. As this fantastic weekend drew to a close on Monday evening the huge crowd started drifting off into the sunset with many happy and cherished memories of the Reunion, memories that will get better with time, just like fine wine. The committee hopes that you all enjoyed the weekend as much as they enjoyed having you attend. The parish of Gortletteragh can take a bow as all the services and events took place within its borders. Between them, The Welcome Inn, Cornageeha; St Joseph’s Church, Cornageeha; Gortletteragh Community Centre, Foxs’ of Tooman, Lough Rynn Castle Hotel and Drumgownagh School excellently hosted the various celebrations and festivities. The Drumgownagh Commemorative book is on sale for €20 in the local shops in Tooman, Mohill, Cloone, Drumlish, Ballinamuck and Dromard as well as from committee members.